Listening last night to President Obama reiterate solar, wind, biofuel, etc., among the renewable energy sources he wants to see as cornerstones of a new green industrial complex in the U.S., one wonders how they’d be incorporated into a smart grid that benefits both consumers and business. The answers to that question are multitudinous and mind-blowing. But here’s one possible synergistic scenario I just read about on Green Tech: a smart-grid project on an island off the coast of Denmark—supported by both the Danish government and IBM—in which energy created by wind turbines is being used to generate electricity for plug-in electric hybrid cars. In an interview on Tuesday, Schurr said that he planned to tell members of Congress that smart-grid technologies are already available and can deliver substantial improvements in efficiency. What’s holding back large-scale adoption isn’t technology but regulations and “institutional inertia,” according to the text of his testimony. Gets pretty damn windy in Chicago, doesn’t it? The most obvious place to create a wind-turbine corridor is through the Great Plains states, which skirt Illinois, but northern Illinois certainly packs enough wind power to feed off such a grid. ComEd and local engineering wunderkinds at some of our universities (I’m looking at you, IIT) have plug-in fever and are seriously interested in pursuing that future agenda. 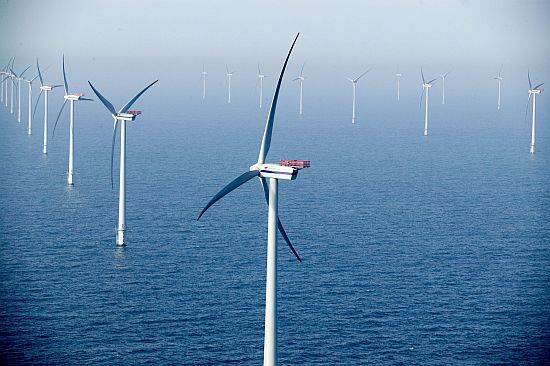 Imagine wind turbines off-shore in Lake Michigan. Possible? Maybe all we need to get a head start in this new game is a strong wind at our backs.